After an epic, opening night meal at Twist by Pierre Gagnaire, we still had time for one more dinner before leaving Las Vegas. Given the over-the-top nature of Gagnaire, I was thinking something lower-end: Raku, Rosemary's, Lotus of Siam, even Hash House a Go Go. My dining companion, however, had had Guy Savoy on the mind ever since reading my first post on the place. I wasn't eager to return though, as much of the menu hadn't changed since June. Obviously, since I'm writing this post, I was eventually convinced--what did it was that the kitchen agreed to customize the tasting menu so that there would be no repeat courses. 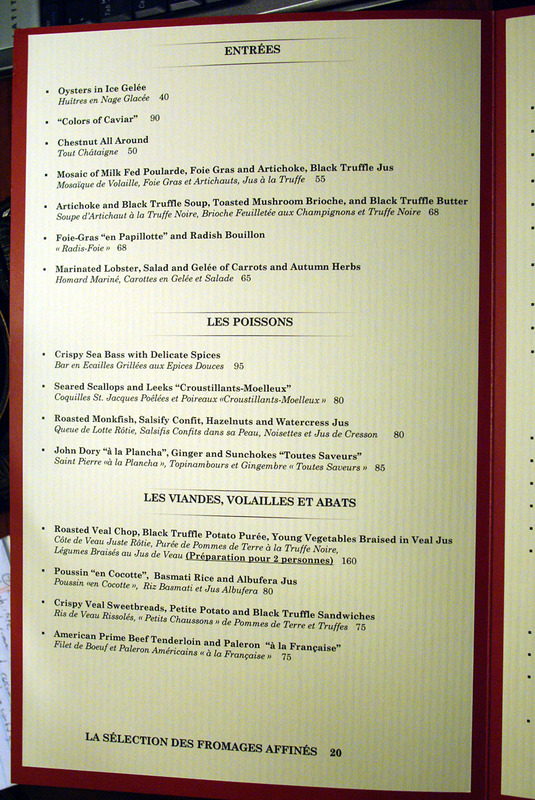 The first two photos above show the standard menu, while the third lists some seasonal specials; click for larger versions. À la carte selections are ridiculously priced, so it's a good idea to choose one of the prix fix options here. Naturally, we had to go with the 10-course Menu Prestige, which, apparently, is ordered by roughly 40% of diners (as reported in Nation's Restaurant News). Had we had more stomach capacity, it might've been interesting to try something from the "La Chasse" ("the hunt") menu, which features game dishes. 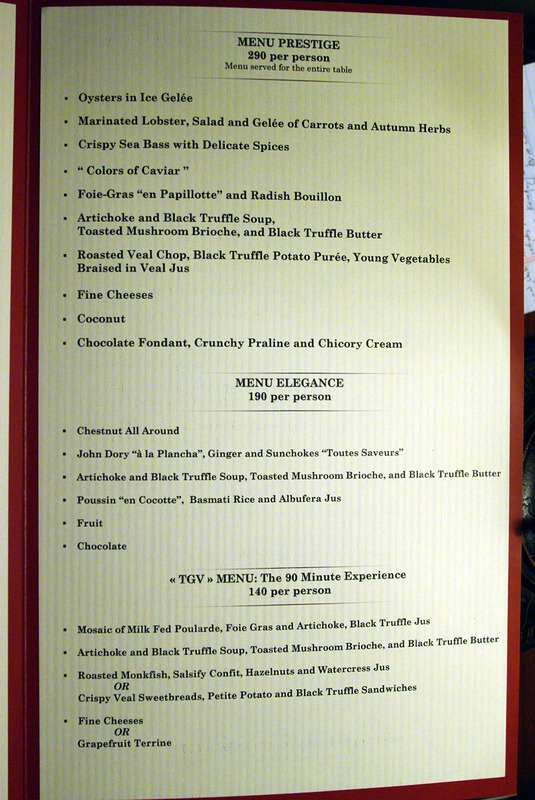 Above, we see the customized degustation that I enjoyed, signed ("Amitiés Gourmandes," or "Gourmet Greetings") by Executive Chef Eric Bost; click for a larger version. 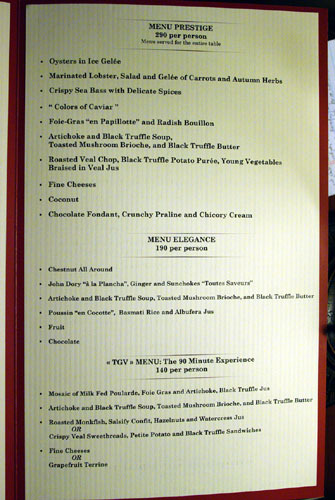 Half of the Menu Prestige was replaced by courses from the à la carte selection; these are denoted "a" below, with the standard items marked "b." The cost of the menu remained the same, at $290, while wine pairings for the decet of dishes added an additional $150 per person. Upon being seated, we were presented with a selection of Champagnes from a rolling cart. My dining companion had the R&L Legras, Guy Savoy Blanc de Blancs, Chouilly, Brut, MV [$29]; don't let the "house" moniker fool you, this was some good, powerful tipple. 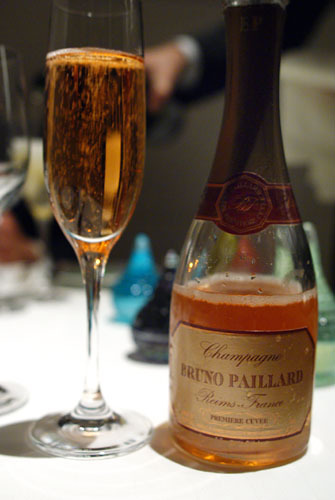 I was in the mood for something sweeter, and thus went with the Bruno Paillard, Rosé, Reims, Brut MV [$22]. It's a wine that I'd quaffed before, notably at Joël Robuchon and Alinea, but it seemed fruitier this time around, showing pronounced citrus notes. The food then began to arrive. First, we were brought the smallest waffles we'd ever seen. 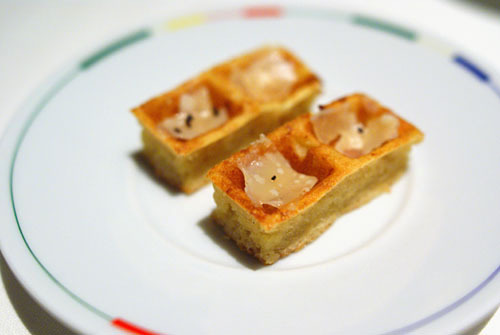 The bits of Parmesan added a slight cheesiness and depth to the otherwise straightforward, nicely textured waffles. Next was the so-called "French Sandwich" (which I'd also had on my previous visit), consisting of toast, foie gras, and black truffle. 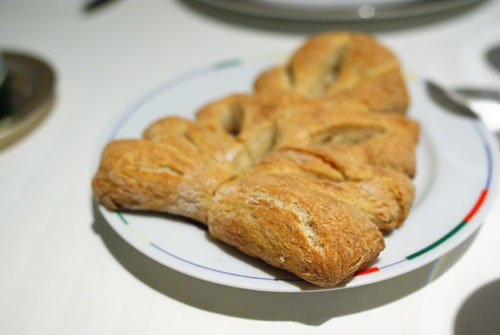 Initially, its flavor was quite mild, dominated by the brioche. However, upon mastication, the foie began to become more and more apparent, leaving a long, lingering finish imbued with the essence of liver. Our final snack was the "French Burger," which was also present last time. It's a micro-burger basically, made from beef seasoned with black pepper, salt, parsley, chervil, onion, and finished with Dijon mustard. Its savor was simply stupendous: superbly beefy with a striking herbal smack and peppery conclusion, with the Dijon providing a fantastic piquant tang. It made me want to try the full-sized burger on the bar menu! At this point, a large loaf of black pepper-rosemary country bread was presented before us; it was delightful, with a pleasant, perky, peppery close. 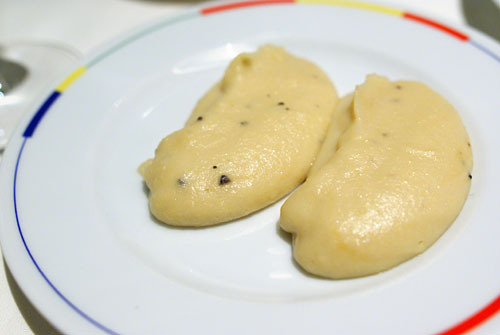 Bread was served with salt, pepper, and unsalted and salted Échiré butters. 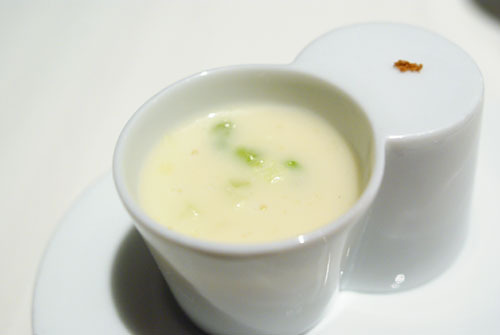 An amuse in two parts: the first comprised small cubes of green apple and celery, covered in a root vegetable cream soup, with a bit of mushroom powder on the side. The hearty, rich attack of the soup belied its delightfully tangy, crispy finish--quite nice, though the mushroom was nearly invisible. The second part of the amuse came when I lifted the cup. What I found was a sort of "chicken salad," but one made with capon (a young, castrated cockerel--male chicken) meat. A capon's flesh is known for its tenderness, and the result here was just about the most refined chicken salad you could imagine. Our meal proper began with oysters--always a good decision. 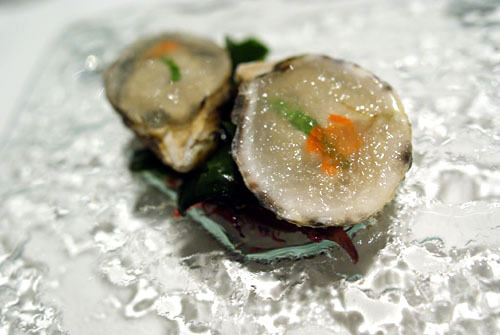 What we had here were Kushi oysters from British Columbia, sandwiched between an oyster crème fraîche and an oyster gelée, garnished with spinach and carrot. The natural flavor of the mollusks was heightened by the jelly, which seemed to be composed from the liqueur of the bivalve itself, while the crème fraîche added palpable weight on the palate. Very nice with the bread, which had a lingering nori-esque finish. This next item was one of the highlights of the meal for me. 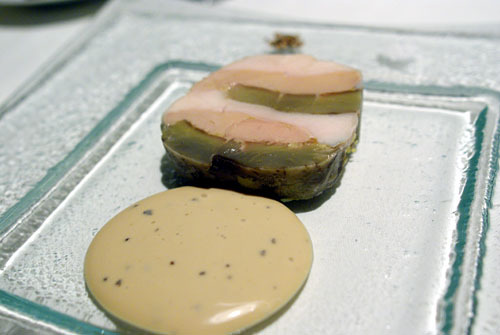 What we have is an amalgamation of poularde, foie gras, and artichoke, accompanied by truffle sauce, salt, and pepper. The key here was the poularde (basically a young hen spayed for fattening, sort of the female version of the capon above), which perfectly captured the pure quintessence of what chicken is all about. 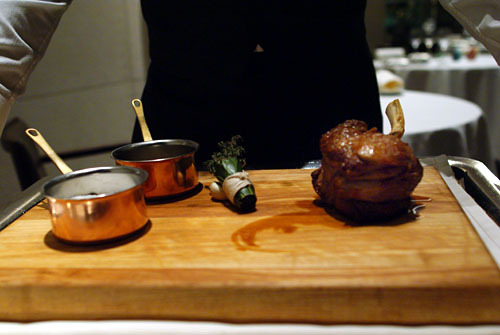 The foie, meanwhile, added a marked gravity to the dish, perfectly accentuating the relatively leanness of the chicken. The artichoke, on the other hand, provided a lightening contrast. The end result was a fantastic interplay of the three elements, with the smack of the poularde alternating with the foie and artichoke. I liked it well enough by itself, but the truffle jus added an extra dose of luxuriousness that made it even better. Easily one of the best chicken dishes I've ever tasted. Here were two pieces of expertly cooked lobster tail, nicely snappy and crunchy, and quite delicious on their own. The crustacean was paired with carrots and various herbs, which provided a vegetal depth to the dish that nicely balanced the sweetness of the lobster. The most interesting facet here, however, was the use of tiny tapioca balls, which added a superb chewiness to the dish that really complemented the lobster's supple flesh. The bread pairing, a seaweed ciabatta, was a superb complement, with its briny flavor underscoring the lobster's natural savor. Cooked, apparently, à la plancha (meaning on a flattop grill), the Dory was definitely one of the better variations I've had. I enjoyed its firm, flaky consistency, as well as its unabashedly savory smack. 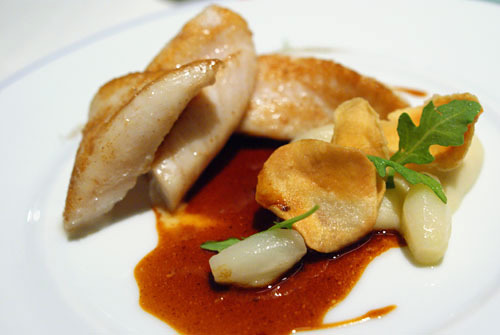 The fish's flavor was augmented by the aggressive balsamic and olive oil sauce, while the sunchokes and ginger especially gave the dish a key mitigating contrast. The lemon bread paired with the fish was interesting, as it added a distinct sourness that countered the savoriness of the Dory. 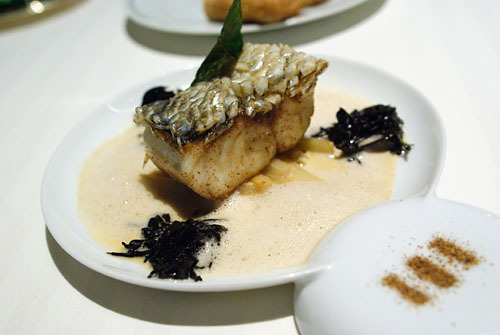 One of Chef Savoy's signature dishes, we have here sea bass, cooked skin side down for crispness, with a ginger-vanilla fish stock foam, served with seaweed and Swiss chard, and garnished with an admixture of spices including black pepper, fennel, and Sichuan pepper. Texture-wise, I had no complaints about the sea bass, as the flesh was rare and tender, replete with a wonderfully crisp, savory skin. In terms of flavor, last time, I felt that the vanilla was a bit overpowering, but I'm glad to report that the dish was better this time around. Overall, it was a more savory, more natural presentation of sea bass I felt, and I loved the contrast between the fish and the brininess of the seaweed. Given the ingredients at play here, there was almost no way that this dish could've turned out poorly. And indeed, it did not disappoint. I first noted the lovely al dente texture of the pasta (orecchiette perhaps? 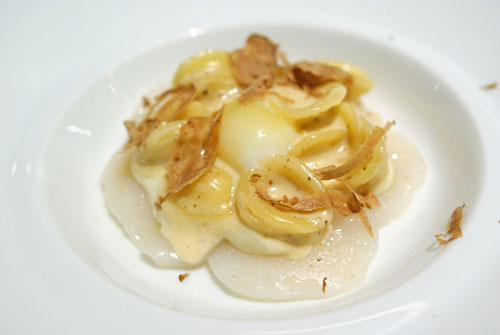 ), which nicely countered the consistency of the scallops. The bivalves themselves were delicate in flavor, yet weighty. Their mildness eventually led to a distinctly truffle-tinged finish, while the midpalate was dominated by the overarching creaminess of the egg. In order to not overwhelm the flavors of the dish, the bread server paired a simple, plain ciabatta with the course. 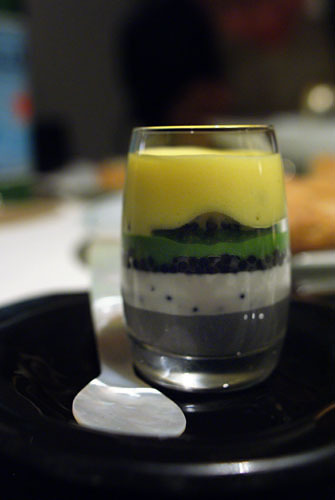 Next was one of M. Savoy's most decadent creations, a multilayered, multitextured amalgam of caviar vinaigrette, caviar crème fraîche, golden Ossetra caviar, haricot vert purée, and hot egg sabayon. This was a fascinating study in the interaction of textures, tastes, and temperatures, with each bite yielding a different flavor progression than the one before it. 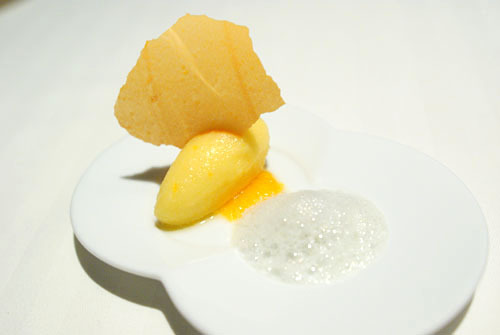 I especially appreciated the relationship between the salty roe and the creamy, eggy sabayon. For this next course, our server brought to the table a tray holding a large chunk of monkfish tail, which had been roasted on the bone for maximum flavor. Afterwards, it was brought back into the kitchen, where it was subsequently filleted and plated. This was definitely a very strong preparation of monkfish, and I quite liked the fish's supple yet spongy consistency, as well as its markedly savory flavor, nicely accented by the brown butter and salsify. 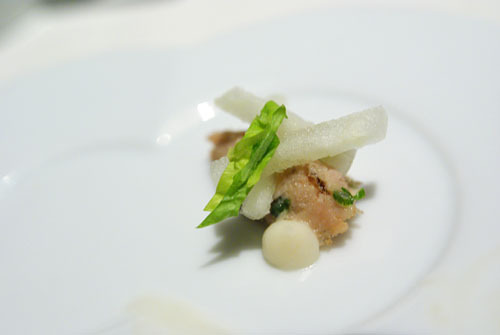 The watercress, meanwhile, contributed a slight bitterness to the dish, while the hazelnuts added a sweet nuttiness as well as a crunchy textural element. 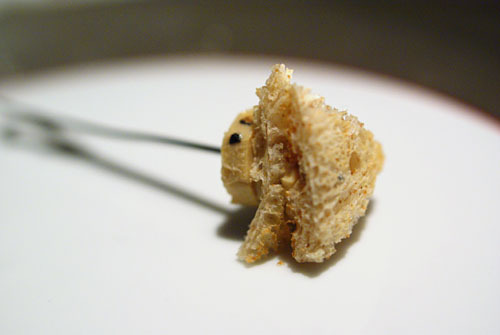 When I had this last time, I declared it the best hot preparation of foie I'd ever had thanks to the bitterness at play--I still stand by that claim. 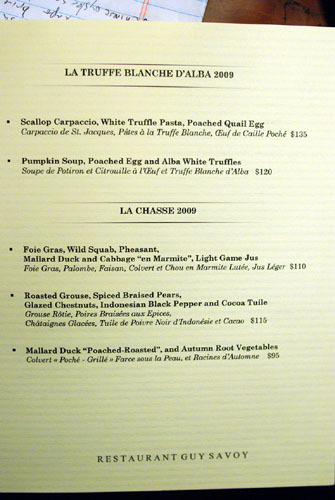 We have Hudson Valley Moulard duck foie gras, which is pan-seared, then cooked en papillote ("in parchment"). 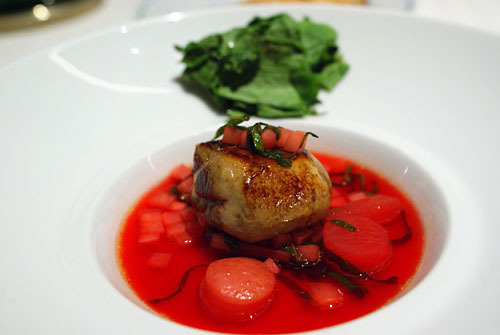 This means that the foie is sealed in a plastic pouch and cooked, steaming in its own juices, with cherry vinegar and pink radishes. The radish did a great job at tempering the gravity of the foie gras, which I believe would've been too overwhelming on its own. In addition, the radish leaves added a bitter, vegetal, piquant smack that further countered the liver. 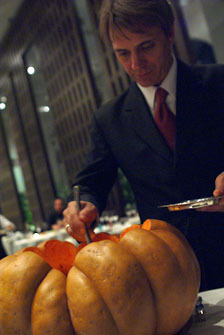 I loved the presentation of the soup here: ladled from a bowl inside of a rather large pumpkin. I was a bit concerned, however, that the concoction would be overwhelmingly sweet. Fortunately, it wasn't. 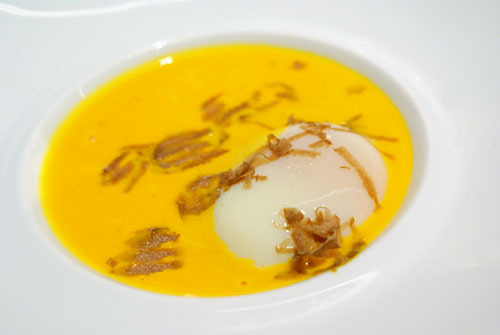 The essence of pumpkin was preserved, but the egg really provided a depth and creaminess that prevented the soup from being overly sugary. 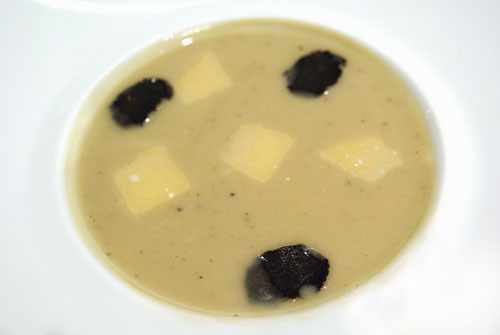 The tinge of white truffle certainly helped as well, giving the potage an earthy bouquet. Very nice with the lush, florid, floral Condrieu. Next up was Guy Savoy's best-selling appetizer, which, according to the same NRN report mentioned above, 70% of diners order. It's, in essence, an artichoke soup, topped with shaved Parmesan and sliced black truffle. The bouquet of the soup was as heady as you'd imagine, imbued with the aroma of truffle and cheese. This continued on to the palate, which was absolutely saturated with flavor, held back tenuously by the relative levity of artichoke. I can see why this is the restaurant's most popular dish. And now, for our "main" course, our server brought out a tray containing a rather intimidating-looking veal chop, replete with bone. After proudly displaying it, he subsequently brought it back for slicing and plating. Regular readers will know that I'm not a fan of veal (finding it rather boring), so this was a pleasant surprise. 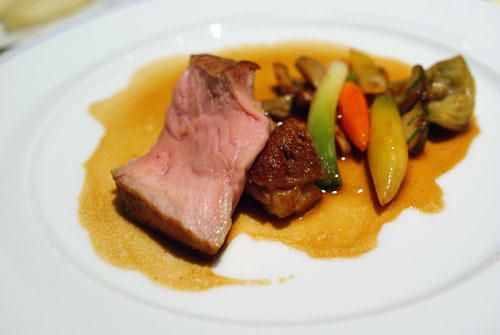 The meat was expectedly tender, but its flavor was quite astounding for veal--an accomplishment indeed--while the vegetables provided a nice counterbalance to the meat. As good as the veal was, it was perhaps outshone by its accoutrement: the black truffle pommes purée. Smooth, creamy, brazenly decadent, these were the same potatoes that warranted a fist pound from Christine (she dined here a week earlier). Crottin de Chavignol - A goat's milk cheese from the Loire Valley, the Crottin was slightly tangy and a bit nutty, with a lovely, somewhat soft body. Sainte-Maure - Sainte-Maure is an unpasteurized cheese made from whole goat's milk, known for its log-like shape, ashy rind, and straw through its center (to help keep its shape). It had a fine, nutty, tangy flavor that I quite enjoyed. Morbier - This was a semi-soft cow's milk cheese named after the village of Morbier, best known for its layer of black ash separating the morning milk from the evening milk. Nice, with a good weight, balanced by a bit of astringency. Comté - One of the most popular French cheeses, Comté is made from unpasteurized cow's milk in the Franche-Comté region of eastern France. Sort of an archetypal semi-hard cheese, it demonstrated mild, ever so slightly sweet flavors. Saint-Nectaire - From Auvergne comes this semi-soft, washed rind cow's milk cheese. Nice and weighty, with some grassy notes to boot. 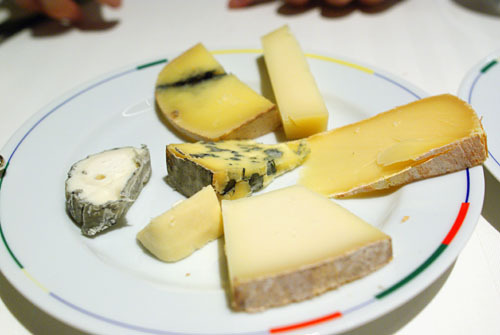 Ossau-Iraty - A French cheese made from sheep's milk, Ossau-Iraty is produced in the Pyrénées. It's a medium-firm cheese with a nicely smooth texture and delicate flavor, with a tinge of sweet nuttiness. Fourme d'Ambert - This was a semi-hard French cow's milk blue from Auvergne, a prototypical blue really, with salty, pungent notes and a bit of nuttiness. Intermezzo: Tangerine "Ménage à Trois"
To transition to the sweets, we were given tangerine in three forms, fruit, sorbet, and chip, all accompanied by a mint foam. The tangerine, expectedly, was refreshingly tart, while the mint gave the pre-dessert a lovely minty finish. I loved the starkly white presentation of the dessert here. 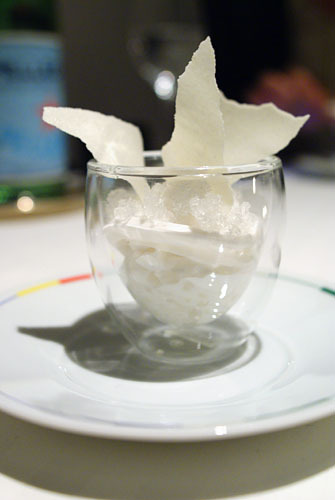 What we have is coconut done six ways: straight, tapioca, cake, emulsion, granité, and chip. The end result was a great interplay of various textures and intensities, all leading to an overarching coconut flavor. 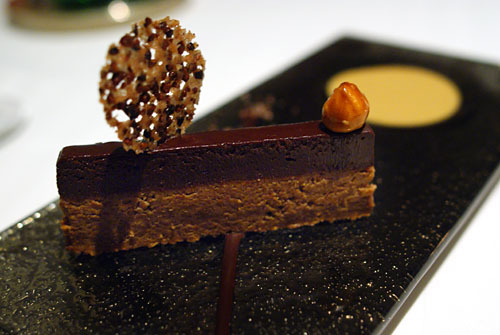 In contrast to the ethereal nature of the coconut six-way, the chocolate dessert was darker, richer, more powerful. The fondant provided most of the chocolate-y goodness, while the praline gave the dessert a fantastic crunch and nutty close. The chicory cream, meanwhile, countered the chocolate with a slight bitterness. Very nice with the paired wine, which we facetiously likened to "adult grape juice." Despite being quite satiated at this point, we decided to do the unthinkable: request one of everything from the dessert trolley! I won't try to describe each item, but I will list all that we ate. 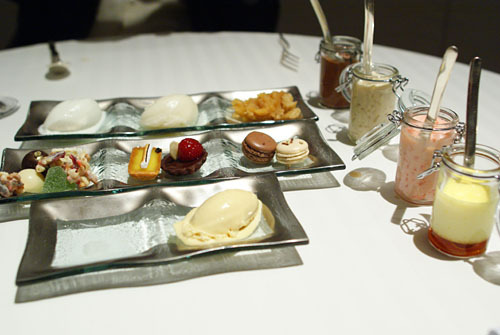 On the topmost plate, we had Lime-Coconut Sherbet, Pear Sorbet, and Apple Compote with Crumble. The first compartment of the second plate held Candied Macadamia Nuts, a Passion Fruit Marshmallow, a Dark Chocolate with Ginger, a Milk Chocolate with Pumpkin, a White Chocolate with Egg Nog, and finally, a Green Apple Paté De Fruit. Filling out the second plate were a Lemon Tartlet with Italian Meringue, a Chocolate Tartlet, a Chocolate Macaron, and a Pecan Macaron. The final plate held Brown Butter Ice Cream. 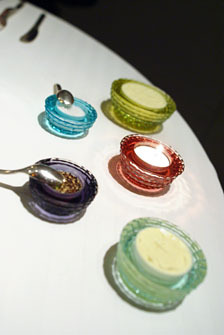 The four little pots on the right, top to bottom, were Chocolate Mousse, Vanilla Rice Pudding, Pink Praline Rice Pudding, and Caramel Flan. Yes, we finished everything. 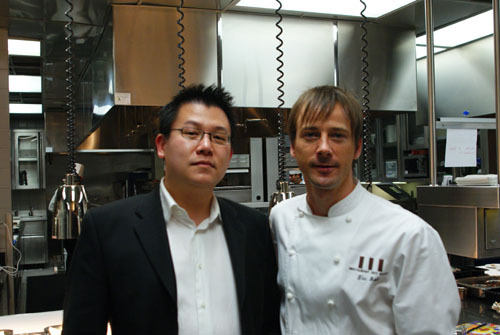 After dinner, we were invited back to the kitchen to speak with Executive Chef Eric Bost. Bost has been with Guy Savoy ever since the restaurant opened in May 2006, working his way up from a Sous Chef position. However, Bost won't be in the house much longer, as he'll be moving to Singapore early next year, to head the kitchens at M. Savoy's latest venture at the Marina Bay Sands (Mario Batali, Daniel Boulud, Wolfgang Puck, Santi Santamaria, and Tetsuya Wakuda will also be opening there--an incredible slate for a single hotel). Bost will be handing over the reins to his Sous, Hugo Coudurier, who we also met briefly. Going into this dinner, I kept telling my dining companion that it probably wouldn't live up to the expectations from my first visit. Well, guess what, it did. 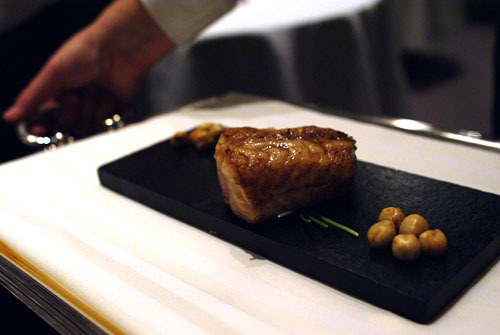 Previously, I'd deemed Savoy worthy of consideration for an upgrade to three Michelin stars. Sadly, the Guide has decided to leave Sin City, but I still stand by my prognostication. It'll be interesting to see how the restaurant changes once Coudurier formally takes over next year. Good thing I stayed up to read this post. 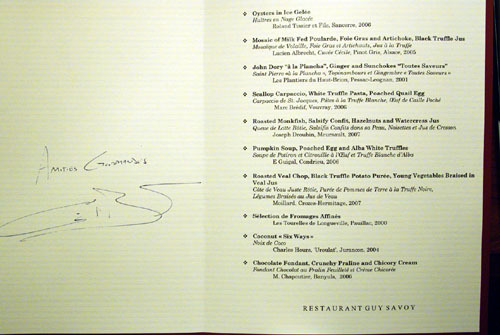 Guy Savoy definitely look like a spot to hit for me in Vegas next time around. Any idea when the Chef is leaving for Singapore?? What an epic weekend... well done Kevin, well done. What do you mean by the kitchen agreed to modify your tasting menus so there wouldn't be duplicate courses? Duplicate from your last visit or you and your dining companion getting the same courses? Sounds like you had a better time at Guy Savoy than Twist? Wow, what an experience! 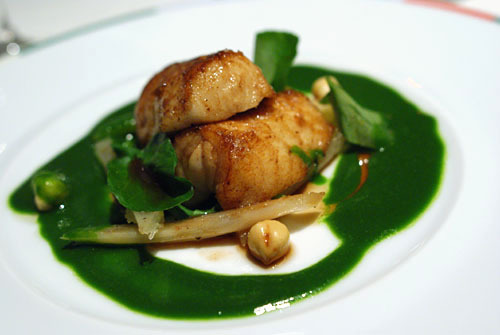 I'm adding Guy Savoy to my list of must-try restos in Vegas. An epic post, Kevin. I need to get back to Vegas more often. Too much good dining in that city! Danny: Definitely. As for Bost, he couldn't give a specific date, other than early 2010--get there quick! Jai: And in two weeks, back in Vegas for Masa! sygyzy: The Menu Prestige was modified so that there would be no duplicate courses from my last visit. Cathy: That's probably a fair conclusion. Jo: Have the waffle, I'll take the burger! Veronique: For sure. What else do you have on there? Linden: Indeed. Problem is that Vegas is close, but not close enough! LA just doesn't have anything like this, which is unfortunate. Kevin, when you go back to Vegas, you have to review Alex. Michelin gave it two stars when the guide came out. It is the only one you are missing from your Vegas lineup. I should have known... are you going to dine at both the Bar Masa and Shaboo portions? Evan: You're absolutely correct. I wanted to do Alex, but unfortunately it's closed on Sundays. Jai: That's the plan. However, if Bar Masa is less than impressive, I may forego Shaboo. Shawn McClain's Sage is a backup (I'll be staying at Aria for convenience). Hey Kevin! When does he leave? I'm starving...Road trip to Vegas? Wonderful review as always! I love your site. Quick question though, on course 5b I noticed that you mentioned en papillote, but then you go on to describe what seems like a sous vide technique. Did I miss something or am I mistaken in my French technique? Anon, I believe that the distinction is that sous vide requires vacuum sealing of the pouch, as well as low temperature cooking over a long period of time. Immersion circulators are also used. "En papillote" is a much more conventional technique. Great Post and fabulous pictures! 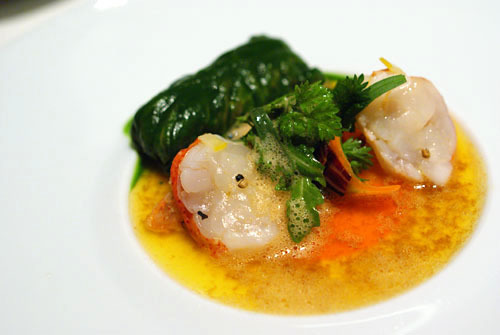 Having cooked for Guy Savoy in Paris for 2 years, I can say that this post really did the food and flavors justice. Well done! Thanks Amy! How does the food here compare to that of the Paris outpost? From what I gather, the intent was to maintain the same level of quality and execution. 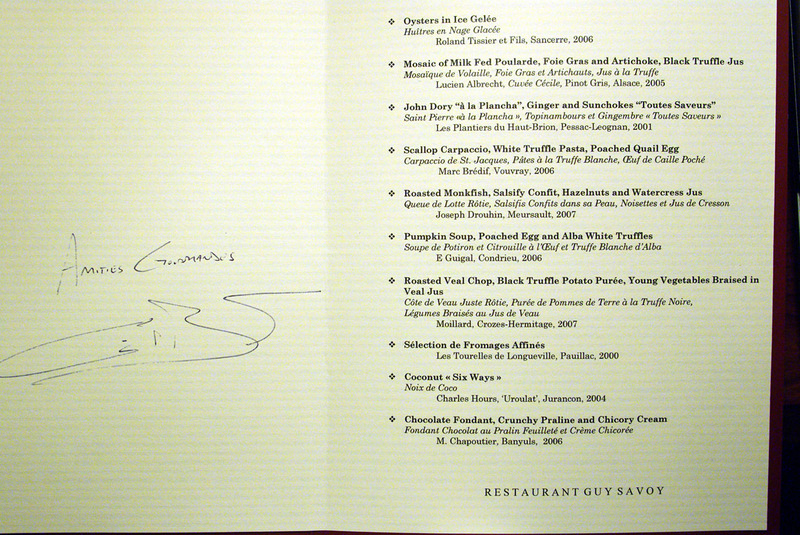 Enjoyed Guy Savoy more than Joel Robuchon overall. Service and food was better at GS. JR had better bread service and mignardises. JR charged me for an anniversary cake, but only gave me a slice. I found the service tacky at times. 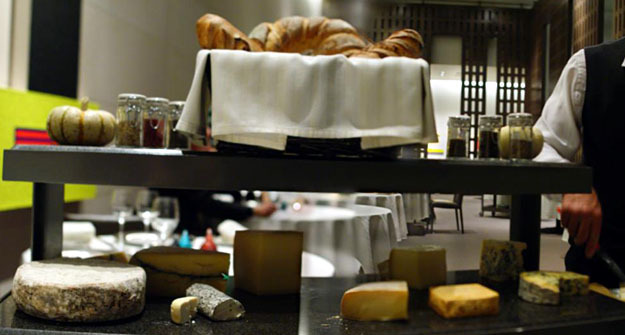 Try the kitchen table at Guy Savoy, they will customize a menu if you ask. We did a mix of signature and innovative dishes. Try the riserva steak at Carnevino, they age it for over 9 months. We got the run around when we requested it, but still want to try. And try Lotus of Siam. Both Jen and I thought if was better than JR. Thanks for the update. I think I might be going to both Savoy and Robuchon later this year. I definitely need to try the Kitchen Table next time at Savoy. I know that they're doing a 13-course "Innovation - Inspiration" menu now for $348pp, so I think I'd go for that, plus supplements. A buddy of mine even said that he wanted to combine the meal with the Krug Menu wine pairings. I appreciate the tip about the Carnevino riserva. We were saying that we wanted to try the new Gordon Ramsay joint, but if we can get Batali's year old steaks, that may change our minds. What exactly was the "run around?" hey, i'm going to vegas this wkend for a short trip, and between twist and guy savoy, which one would you recommend? i'd only try one of them. Sorry for the late response Daniel. Where did you end up? I know that Savoy was actually closed until the 22nd. ended up going to twist, we stayed at mandarin oriental, so it was much more convenient. liked the view. kinda reminded me of per se. food was overall good and enjoyable, but the only dish i really remember and still salivate after is the "french riviera". man that mozzarella icecream with the pasta was so good. Thanks for the report back. I'll actually be going to Vegas toward the end of September. 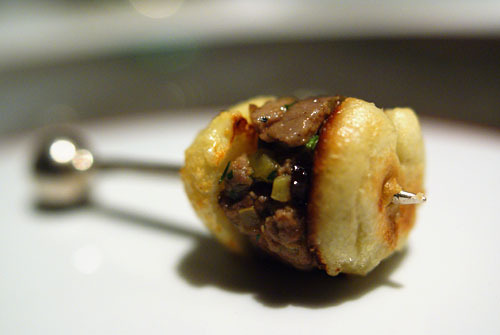 Savoy, Robuchon, and the new Gordon Ramsay Steak are on the docket.